Home » Articles and Videos » Why Consider Multiple Sources of Retirement Income? When it’s time for you to retire, it’s likely you’ll need a source of income to replace your salary. And for many people, Social Security just isn’t enough. So how do you generate a reasonably stable income that will last as long as you do? The solution may be to have several sources of retirement income, rather than just one or two. The reason for this is very simple: if your main source of income declines, or can’t keep up with inflation or healthcare costs, you might not be able to maintain your required level of spending. So having multiple sources of non-correlated retirement income may make a lot of sense. But where does it come from? 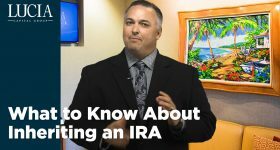 You might want to start by converting a portion of your retirement nest egg into cash or a reasonable cash equivalent to provide for short-term spending needs. Short-term liabilities should always be matched with short-term assets so that volatile investments will not have to be sold at a potential loss in order to support a current income need. You might also consider an annuity as another alternative source of retirement income. Yes, an annuity. The strategic use of certain annuity contracts in lieu of bonds in a portfolio, along with a certain allocation to stocks, may not only provide for current guaranteed lifetime income but also leave your heirs with an even greater legacy. And some annuity contracts can even be designed with a rising income stream to help offset future inflation. Additionally, more aggressive investors may want to explore allocating some assets into alternative income investments. This might include participation in passive businesses, real estate, private debt, and certain hedge funds, to name a few. Keep in mind that these don’t come with any guarantees, so you’ll want to limit your allocation because of the added risk. And finally, you might consider dividend-paying stocks as an alternate source of income if you can tolerate some volatility and have a long time horizon. While it’s not guaranteed, some blue-chip companies have not only paid dividends consistently but also increased them for 25—or even 50—consecutive years. 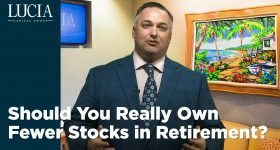 Think about it: cash or liquid equivalents, an income-producing annuity, alternative investments (such as cash-flowing real estate), and dividend-paying stocks, along with pensions and Social Security, are all sources of potential retirement income. But here’s the thing: you shouldn’t wait to put this kind of plan in place. At Lucia Capital Group, we’ve done it for thousands of people all across the country. Just give us a call. We’re here to help! Information presented should not be considered specific tax, legal, or investment advice. You should always seek counsel of the appropriate advisor prior to making any investment decision. All investments are subject to risk including the loss of principal. This material was gathered from sources believed to be reliable, however, its accuracy cannot be guaranteed. The information provided is based on current laws, which are subject to change at any time. Lucia Capital Group is not affiliated with or endorsed by the Social Security Administration or any government agency. Social Security rules can be complex. For more information about Social Security benefits, visit the SSA website at www.ssa.gov, or call (800) 772-1213 to speak with an SSA representative. Different types of investments and/or investment strategies involve varying levels of risk, and there can be no assurance that any specific investment or investment strategy (including the investments purchased and/or investment strategies devised by LCG) will be either suitable or profitable for a client's or prospective client's portfolio, thus, investments may result in a loss of principal. 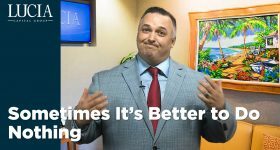 Accordingly, no client or prospective client should assume that the presentation (or any component thereof) serves as the receipt of, or a substitute for, personalized advice from LCG or from any other investment professional. It is important to keep in mind that investments in fixed income products are subject to liquidity (or market) risk, interest rate risk (bonds ordinarily decline in price when interest rates rise and rise in price when interest rates fall), financial (or credit) risk, inflation (or purchasing power) risk and special tax liabilities. Interest may be subject to the alternative minimum tax. Treasury securities are backed by full faith and credit of the U. S. Government but are subject to inflation risk. 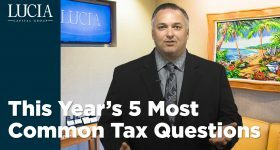 Raymond J. Lucia Jr. is chairman of Lucia Capital Group, a registered investment advisor and CEO of its affiliated broker-dealer, Lucia Securities, LLC, member FINRA/SIPC. Advisory services offered through Lucia Capital Group. Securities offered through Lucia Securities, LLC. Registration with the SEC does not imply a certain level of skill or training.